In its mission to provide Josenians and its surrounding communities with quality pre-hospital emergency care, the Adelante Life Emergency Rescue Team (A.L.E.R.T) hosted the first Recoletos Emergency Services Convention and Unification Event (RESCUE) last April 27-28 at the Talavera House of Prayer. Distinguished guest speakers were invited to share their organization’s best practices. They were from the Department of Health- Region VII (DOH), Emergency Rescue Unit Foundation (ERUF), HAM Radio Cebu, Cebu City Disaster Risk Reduction Management Office(CCDRRMO), Cebu Provincial Disaster Risk Reduction Management Office (PDRRMO), Danao City Disaster Risk Reduction Management Office, Commission on Higher Education-Region VII (CHED), Recoletos Industrial and Technological Training Center (RITTC), and USJ-R ALERT. The two-day event centered on topics which can level up the knowledge and skills of the attending rescuers. On the first day, the topics discussed were Emergency Medicine, Intra-venous Cannulation & Intro to Advance Airway, and Communication Protocol. Vehicle Extrication using a rescue truck from Danao DRRM Office, Emergency Vehicle Operation Course, Incident Command System & Disaster Response Protocol, Schools’ Safety Management, USJ-R School DRRM Organization, RITTC EMS NC-II Orientation & other TESDA offered Programs. After the discussions at Talavera, the participants were headed to the football field of USJ-R Basak Campus and literally formed a “Human Star of Life”. It symbolizes unification and camaraderie among rescue group participants and its’ host. STAR OF LIFE. 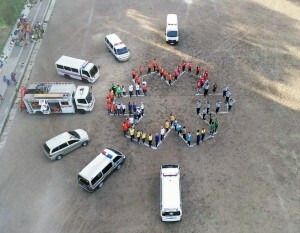 Rescuers from multiple emergency response organizations form a human star of life symbol together with their respective emergency vehicles. The 1st R.E.S.C.U.E. had been actively participated by representatives from DYA-Bacolod Philippines, Inc., University of Negros Occidental – Recoletos (UNO-R Negros Occidental), Colegio San Nicolas de Tolentino – Recoletos (Talisay City Negros Occidental), Colegio de Sto. Tomas – Recoletos (San Carlos City Negros Occidental), Parish Emergency Rescue Unit Volunteers headed by Rev. Fr. Roderick T. Dequit, OAR together with PERUV Founder Rev. Fr. Rouel M. Sia, OAR (Valencia – Negros Oriental), USJ- R Junior ALERT of College of Nursing students, USJ-R Junior ALERT Student Organizations, USJ-R Junior ALERT Club represented by USJ-R Junior High School & selected Senior High School students and our very own USJ-R ALERT. 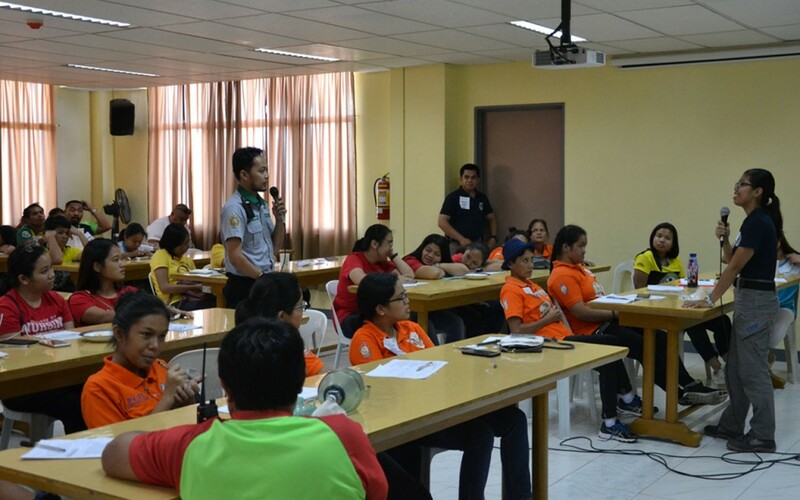 The second day of the event was a scheduled tour to the following locations namely Cebu Provincial Disaster Risk Reduction Management Council, Cebu Provincial Capitol Grounds and Emergency Rescue Unit Foundation – Mandaue Training Center. An awarding ceremony to all the participants was done after lunch at USJ-R Talavera House of Prayer.